Home > Craft Spaces > Setting up my craft space – work in progress! So after my accidental knitting machine purchase last Saturday I realised – I had nowhere to put it when it arrives! I have wanted to sort out a dedicated craft space in our house for a while, but this was just the push I needed to get it done. I’m really pleased with how it’s looking so far, but it’s taken a bit of work just to get to this stage! First up was the trip to Ikea on Monday night – that’s truly the sign of madness in my book! My lovely husband picked me up from work and after a quick pub dinner we hit Ikea, going through the big blue doors at about 7pm. Before we went in, I was convinced that I wanted a plain white Malm desk – looks nice, right? Unfortunately in person it just wasn’t right and I fell for a beautiful bamboo desk instead – the Hilver – look at its beautiful midcentury styling! Swoon! Then, they didn’t have the table top in stock – and I started to get disheartened. But then I remembered all the reasons I had wanted a white desk – it really will be better to see my work on a white background. So I went for a nice high gloss white top, but I just had to get those gorgeous Hilver table legs – and I’m delighted with the result. It’s hard to see in the photo above – and hard to photograph in my tiny room – but it works really well. I’m so excited to get this space fully operational with my knitting machine in situ. I love being right by the window – I’ve spent a lovely few hours today looking out at people going about their business whilst I work. I do think I need to get some yarn-y goodies up around the window though – I’m thinking some bunting? Or a pom-pom garland? Or both? One problem with working on something involving a lot of moving stuff around and building a new table has been cats! I have two lovely male cats, who are my biggest fans – they’ve been “helping” me all day…! Sigh… Hopefully they’ll come to terms with the change soon! Looking good! Wishing you every success! Such a gorgeous crafting space! You won’t be disappointed with your knitting machine – I can’t wait for more updates. 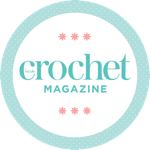 V jealous of your craft room 🙂 and I had no idea there was a Cath Kidston crochet book! I’ll be trawling the interwebs for a copy later! A lovely new area to work in, wishing you every success along with the cats! My first week on Handmade Monday too, but definitely not sewing or knitting machines for me!